Cinnamon is praised for its high-quality oil content, nutritional value, and antioxidant, antibacterial, and anti-inflammatory properties. For these reasons, cinnamon cultivation is performed in various countries, typically in tropical areas. Growing cinnamon is possible indoors or outdoors and if done correctly, the plant will produce very beneficial bark, leaves, and buds. While cinnamon can take a few years to fully develop, the health benefits coupled with cosmetic and culinary uses of this plant contribute to the reasons why cinnamon is still so popular. The following growing guidelines will help you to succeed in its cultivation. Cinnamon cultivation can be successful using a variety of soils, from silver sands to loamy and gravelly soils. However, the highest quality of cinnamon is produced using white silicatious sandy soils. The soil should be well-drained, since cinnamon roots rot in extremely wet terrain. Cinnamon requires strongly acidic soils, with pH levels ranging 4.5 - 5.5. It is possible to cultivate cinnamon from cuttings of young shoots, but the easier and more common method is propagation by seeds. For the most successful cinnamon cultivation, select seeds from plants with an erect stem, smooth bark, vigorous growth, resistance towards pests and diseases, high oil content, and stem bark that peels with ease. The ripe seeds should be piled in the shade until the pulp turns black and disintegrates, typically after two to four days. The seed should then be separated, washed, dried in the shade, and planted rather quickly, ideally 7 - 10 days after collecting them. It is best to pick a planting spot with full sun. When planted directly in the ground, 15 - 20 seeds should be sown in 12 x 12 x 12 inch (30 x 30 x 30 cm) holes. The holes should have a spacing of 4 x 4 feet (1.2 x 1.2 m) and be filled with topsoil. Cinnamon trees are easy to grow inside, as long as the correct pot size is chosen to accommodate root development. A pot with a diameter of 18 - 24 inches (46 - 61 cm) and a height of 20 plus inches (51 cm) is ideal for indoor cinnamon cultivation. It is recommended to select a pot with adequate drain holes. For even less maintenance, choose a glazed pot, which requires significantly less watering than terracotta pots. Plant the seeds half an inch (1.5 cm) deep in the pot with a spacing of 1.2 inches (3 cm) between the seeds. 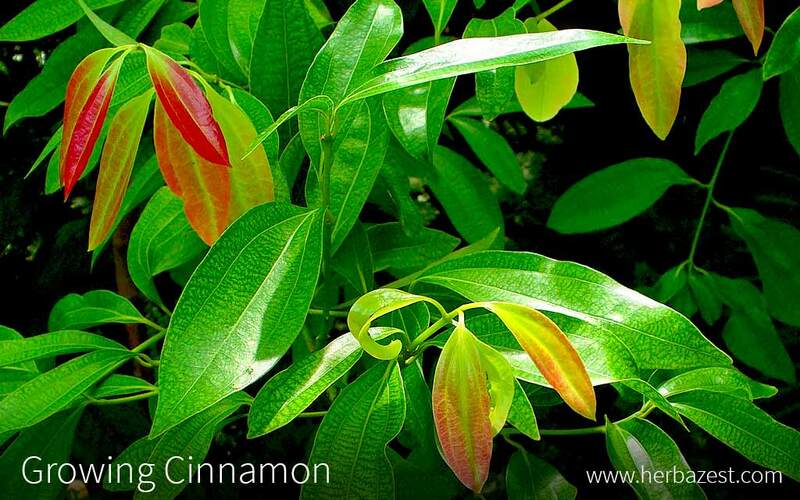 Since cinnamon trees require full sun, the pot must be placed in a window location or a bright and sunny greenhouse. With proper conditions, indoor cinnamon trees grow to reach 4 - 5 feet (1.0 - 1.5 m) in height. Cinnamon cultivation can withstand some water stress, but long-term watering or overwatering can cause decay or kill the tree. Lightly soak the soil of the cinnamon trees and do not water again until the top two inches (5 cm) of soil are dry. Depending on conditions, watering may be necessary weekly or daily. Once the trees have matured, watering is normally only done during periods of drought. The most common fertilizers used in cinnamon cultivation are animal, plant, or still residues. This is usually accompanied by the mulch from weeding or surplus leaves and twigs from harvest. When the soil is moist - typically after watering or rain - apply fertilizer at a 20-inch (50-cm) radius around the plant or between rows. Once the fertilizer is applied, be sure to fork it into the soil. Once the cinnamon is mature, usually after three years, double the dose of fertilizer for every successive application afterwards. Without fertilizer, the soil will exhaust its supply of nutrients, which will cause a mineral deficiency and yield drop. This in turn will adversely impact the bark and leaves by lowering their oil content, which should be avoided because the oil is believed to be responsible for many of cinnamon's health benefits. Pruning leaves and burying weeds is helpful for cinnamon cultivation. After about two years, cut back the main stems alternately. Use a sharp knife at a 30-degree angle facing inwards and cut the stems to a height of about 1.6 - 2.4 inches (4 - 6 cm) from ground level. Cutting at this angle allows the plant to spread outwards and each base of the cut stem to grow three healthy new stems. This produces five to eight stems from a single bush for harvesting per year after 8 - 10 years. The side branches should also be cut from the main stem to help encourage strong growth by exposing the base of the plant to sunlight. It is important to protect cinnamon trees against weeds, which can reduce the quality of the plant. For the first two years of cinnamon cultivation, manual weeding should be done three or four times. After two years, twice per year is enough. While cinnamon essential oil is used as a natural repellent for pests, and all species of cinnamon are considered hardy plants, cinnamon trees can be threatened by variety of insects and microbes in their native areas. The major pests reported in Asian countries include a jumping plant louse (Trioza cinnamoni) and mites (Eriophyes boisi and Synanthedon spp.). Less significant pests are caterpillars, borers, and leaf miners. Pests can cause significant damage to young cinnamon stems and bark, but they can be eradicated using authorized herbicides. In the particular case of borers, insecticides won't affect the larvae beneath the bark. To be effective, the bark should be carefully sprayed at the time the eggs are laid, especially on wounded bark. Completely spray the branch surfaces as a preventive measure. There is no need to treat the foliage - especially the upper canopy. In order to avoid infestations, keep vegetation and mulch away from the base of the tree. Since the bark is the most valuable economic product of the cinnamon tree, a good selection of insecticides is crucial. The introduction of weaver ant colonies is also recommendable as a natural control strategy, since the ants act as gregarious predators and safeguard the plant from insect pests. The main reported diseases of cinnamon are grey leaf spot or blight, but stripe canker and pink disease can also affect the stems of cinnamon, and brown root rot has been observed, too. To control leaf spot disease, the use of fungicides is advised, while bark diseases are usually controlled by regular removal and destruction of affected bushes and seedlings. Selective pruning can also be practiced. Once a cinnamon tree has grown for two years and reached a height of 5.0 - 6.5 feet (1.5 - 2.0 m), it can be harvested. Visual signs indicating that the plant is ready for harvest include the brown color of the bark and the hardened leaves. Depending on rainfall and soil fertility, cinnamon can be harvested two to three times a year, typically from May to August, and starting again in November. It is easiest to harvest in the rainy season because the cinnamon bark will peel away more easily. Use a small knife to ease off the inner bark into strips roughly 42 inches (1 m) long. For a fine bark, harvest the stems every six months, but for a coarser bark, harvest at eight-month intervals. The leaves can be cut off as soon as they have turned dark green. After the first cutting, roughly five or six shoots or branches can be harvested every second year. After harvest, cinnamon bark is dried under the sun for a few hours, at which point it naturally curls into a pipe-like structure, known as a quill. A typical quill tube is roughly 42 inches (1 m) and can be used to fill with small pieces of the stem. The quill tubes should be kept indoors to dry for about four to seven days.